IMAGE: Left hand slip turn retained at the western end of Bird Avenue. 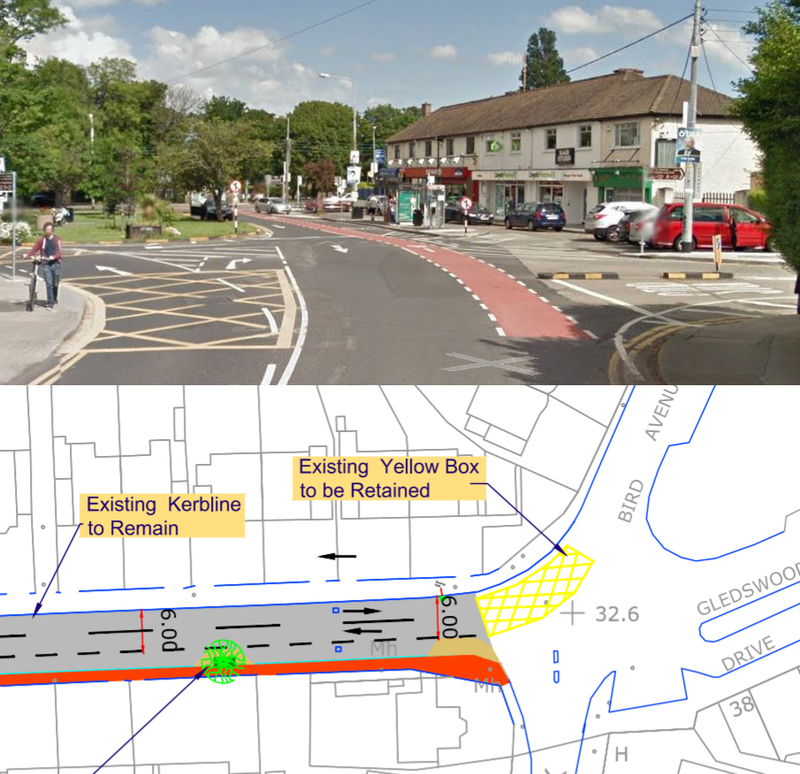 National guidance was used by Dun Laoghaire-Rathdown County Council to justify a lack of space for cycling on a redesigned road, but the council has again ignored guidance on the removal of slip turns which are a danger and inconvenience for walking and cycling . IMAGE: At the eastern end of the scheme the council has not tackled a junction which is unfriendly to cycling and walking. In reply to a tweet from a member of the public the council said there was not enough space for cycle tracks and pointed to the consultation page for the project. At least they got one thing right: “narrow carriageways are one of the most effective design measures that calm traffic”. But of course as long as motorists in this country consider bicycles as a pest they will endanger them even more on these narrow carriageways. So how are HGV drivers to give cyclists 1.0 m safe overtaking clearance on these vehicle lanes? Unacceptable design that totally refuses to put in a cycle path on exceptionally wide footpath. So do narrow carriageways, by themselves, reduce motor vehicle speeds to a level that is appropriate for narrow roads shared with vulnerable road users? This should be the first question. If the response is that they “reduce speeds by factor “x”” then this is irrelevant if that final speed is still too high and unsuitable for roads with mixed traffic. (Anyone who cycles on rural secondary N roads with a speed.limit of 100 kmh already knows the answer to this question) The advice in DMURS on road widths invites the accusation that they are using cyclists (unprotected human beings outside cars) as a form of mobile ” traffic calming”. (This wording is adapted from a UK Transport Research Laboratory report that observed that cyclists were effectively a traffic calming feature at “pinch points”. Worse still the DMURS road width advice means that cyclists are systematically obstructed, by design, anywhere that queues of car traffic happen to form. This is the kind of thing that happens when the Department of Transport Tourism and Sport declines to recognise vulnerable road users as “stakeholders” in the formulation of road design guidance. Which is exactly what happened. To my knowledge – there was no formal or informal consultation with cycling (or walking) NGOs in the drafting of DMURS. A curious feature in the Bird Avenue photograph is the presence of central lane markings. The use of central lane markings would have the effect of encouraging increased traffic speeds. Conversely removing centre lines is a proven speed reducing measure. If the claimed intent is reduced traffic speeds then this claim is not supported by the road markings applied. Studies have found that narrowing the road make it safer and have also found that segregated cycleways also improve safety.Now if only we could find a way to do both togather.